Brandon Sanderson is a man with a formula. Luckily for us all, he knows the formula so damned well that he can use it to tell a compelling story in almost any genre. Skyward is the story of Spensa (which sounds far less pretentious when you just pronounce is Spencer), a young girl facing the adversity of an entire community’s distrust. Set against a backdrop of humanity on the ropes, trapped on a planet, surrounded by enemies who come from space determined to wipe them out, Spensa must join Top Gun, and learn to fly. I wasn’t sure about this book. I picked it up on a BookTuber’s recommendation (Thanks KittyG), because she was so damned enthusiastic about it… But it’s YA. And it’s Sanderson, who I like and respect to hell, but don’t love. Turns out, it’s fantastic book full of edge of your seat action, heartfelt friendships and the loss of the goodbyes, quirky characters (that’s kind of Sanderson’s thing), and a slightly buried message about heritage being a prison. There were bits that annoyed me, an obnoxious AI that never quite crosses the line into charming, story threads that seemed like they had to go somewhere and then didn’t. But overall, every time I put the book down, I was raring to pick it back up again. That’s the sign of a good book to me. I kind of want to break my own rating rules and give it 5 stars because I loved it so much. But I won’t. The reason I’m not breaking my rules is because it falls back on the old chosen one trope a bit, relying less on teamwork in the end, and more on Spensa’s hidden power. But hey, it’s YA. One other thing I have to note is that I listened to the audio of this one and the narrator, Sophie Aldred was AMAZING. She brought the entire cast, especially Spensa, to life in a way that felt natural. Looks like I have another favourite narrator to check out more books from. 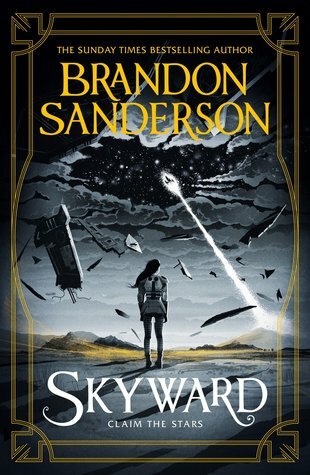 4 out of 5 stars for Skyward. Spensa can be my wingwoman anytime… sorry, had to get another Top Gun reference in there.